Our latest 2015 findings from the Registry can be found in the graphs, below. Our 2015 Registry Report can be viewed here. For the period from 1 January to 31 December 2015, the Registry recorded 11,189 self-harm presentations to hospital that were made by 8,791 individuals. Thus, the number of self-harm presentations and the number of persons involved were similar to those recorded in 2014. 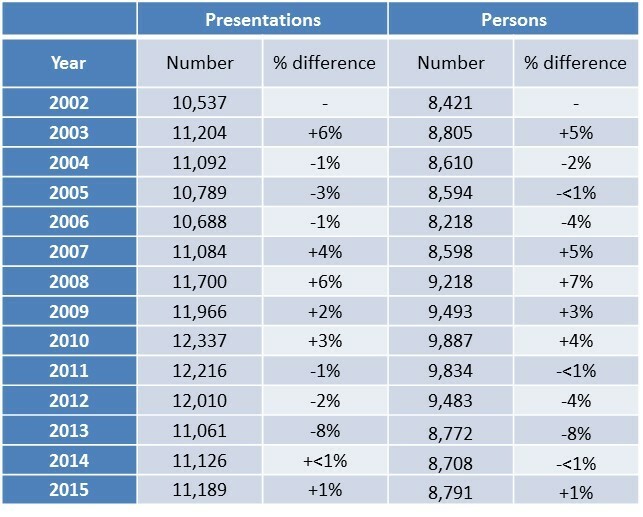 Number of self-harm presentations and persons who presented in the Republic of Ireland in 2002-2015 (2002-2005 figures extrapolated to adjust for hospitals not contributing data). The age-standardised rate of individuals presenting to hospital in the Republic of Ireland following self-harm in 2015 was 204 per 100,000. Thus, there was a 2% increase in the age-standardised rate in 2015. This increase was not statistically significant. In recent years there were successive decreases in the self-harm rate between 2011 and 2013, and an essentially unchanged rate between 2013 and 2014. However, the rate in 2015 was still 9% higher than in 2007. 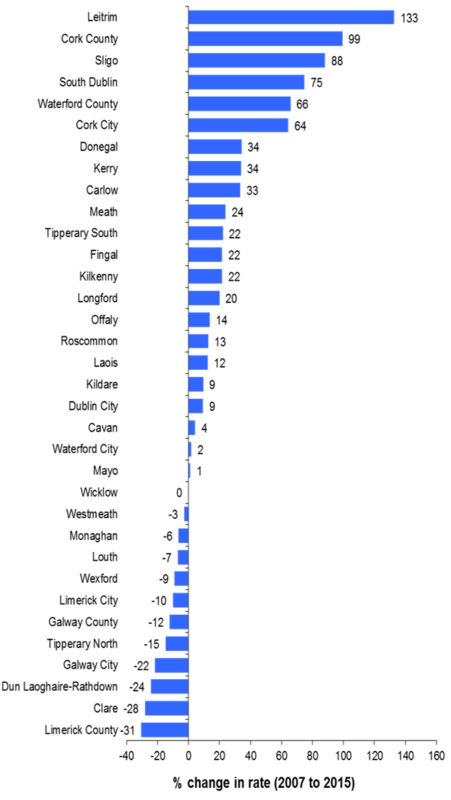 Person-based European age-standardised rate (EASR) of self-harm in the Republic of Ireland in 2002-2015 (extrapolated data used for 2002-2005 to adjust for non-participating hospitals).E.g. in 2015, for every 100,000 people, 186 men would have presented to an ED following self-harm, or 1 in every 538 people. 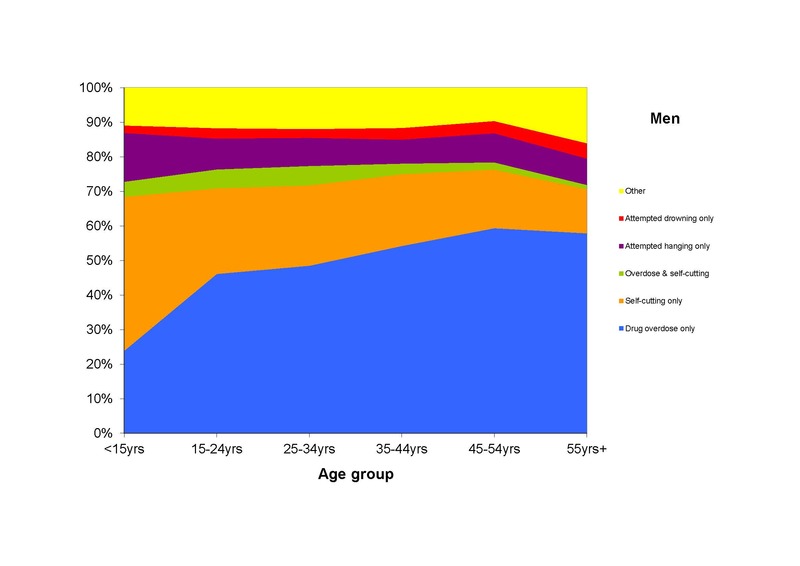 There was a striking pattern in the incidence of self-harm when examined by age. The rate was highest among the young. At 718 per 100,000, the peak rate for women was among 15-19 year-olds. This rate implies that one in every 139 girls in this age group presented to hospital in 2015 as a consequence of self-harm. 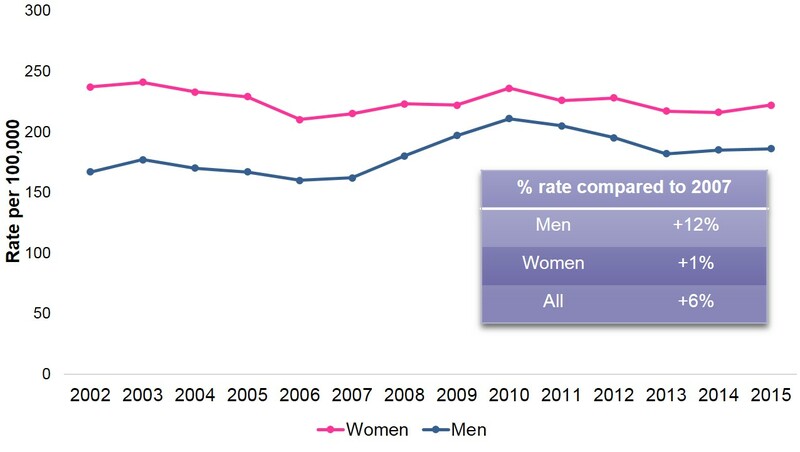 The peak rate for men was 553 per 100,000 among 20-24 year-olds or one in every 181 men. The incidence of self-harm gradually decreased with increasing age in men. This was the case to a lesser extent in women as their rate remained relatively stable, at about 231 per 100,000, across the 30 to 54 year age range. There were significant year-to-year increases in the rate of hospital-treated self-harm in Ireland since the advent of the economic recession in 2008. Despite decreases in recent years, the overall rate has increased by 9% since 2007, from 188 to 204 per 100,000. The male rate has increased by 15% from 162 to 186 per 100,000 and the female rate has increased by 3% from 215 to 222 per 100,000. 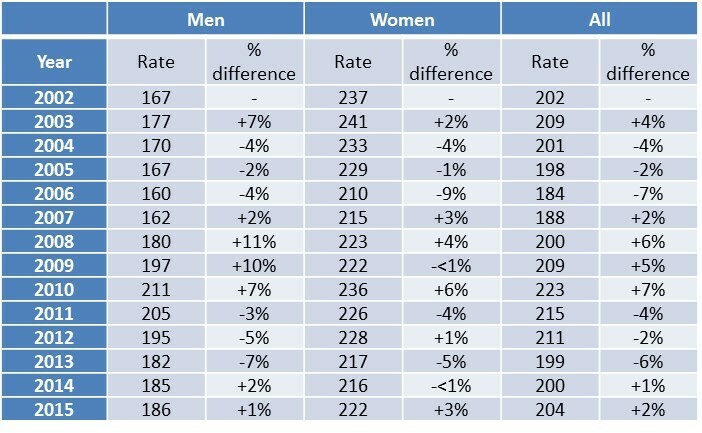 There have been notable increases in the male rate of self-harm in Leitrim, Cork County, Sligo and South Dublin. 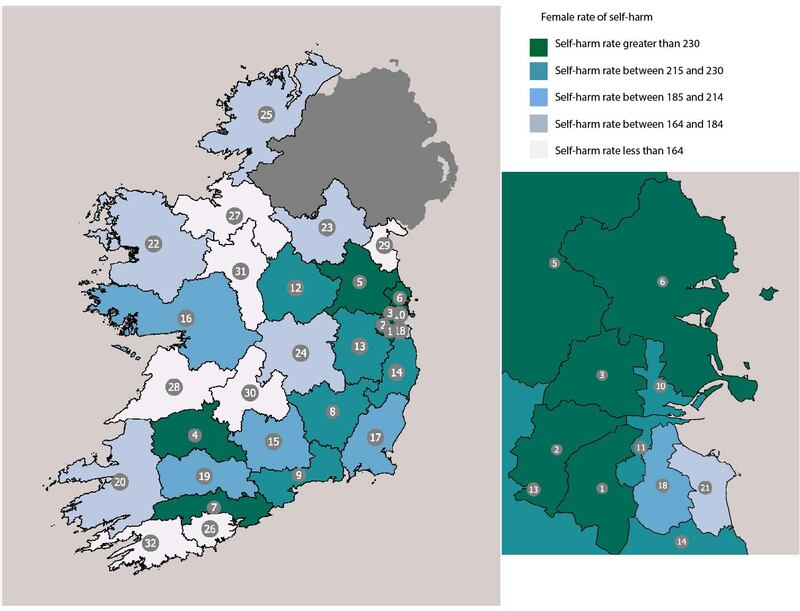 Increases in the female rate of self-harm were observed in Leitrim, South Dublin, Kilkenny and Longford. The maps below ‘Person-based European age-standardised rate (EASR) of self-harm in the Republic of Ireland in 2015 by HSE Local Health Office area’ details the population (derived by the National Census 2011), number of men and women who presented to hospital as a result of self-harm and the incidence rate (age-adjusted to the European standard population) for each LHO area. 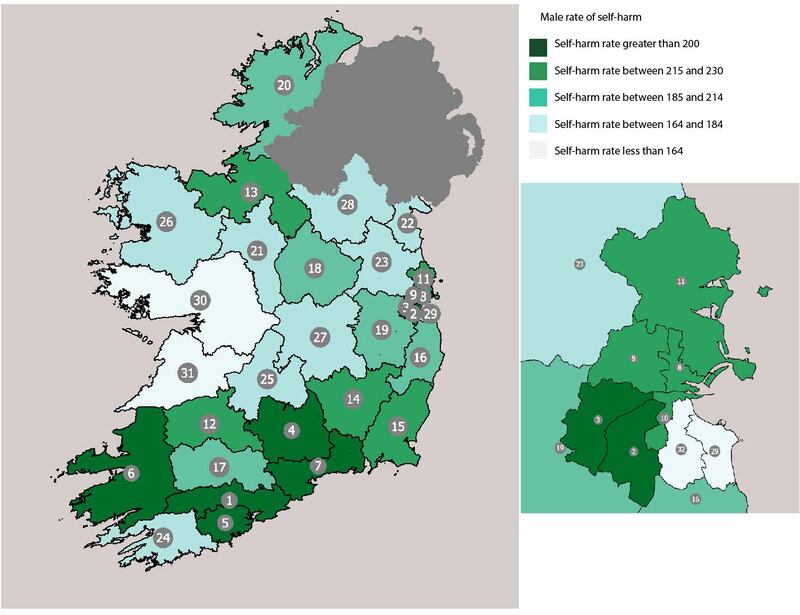 Thematic maps are also provided below to illustrate the variation in the male and female incidence of hospital-treated self-harm by LHO area. There was approximately a two-fold difference in the rate of self-harm when examined by LHO area. The rate for men ranged from 64 per 100,000 in Dublin South East to 255 per 100,000 in Cork North Lee and for women ranged from 110 per 100,000 in West Cork to 312 per 100,000 in Dublin South West. 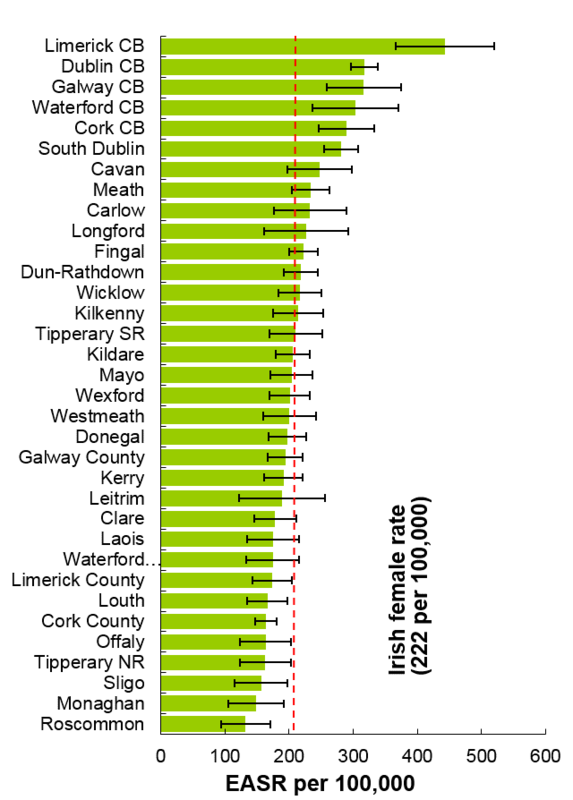 The female rate exceeded 240 per 100,000 for Dublin South West, Dublin West, Dublin North West and Limerick. 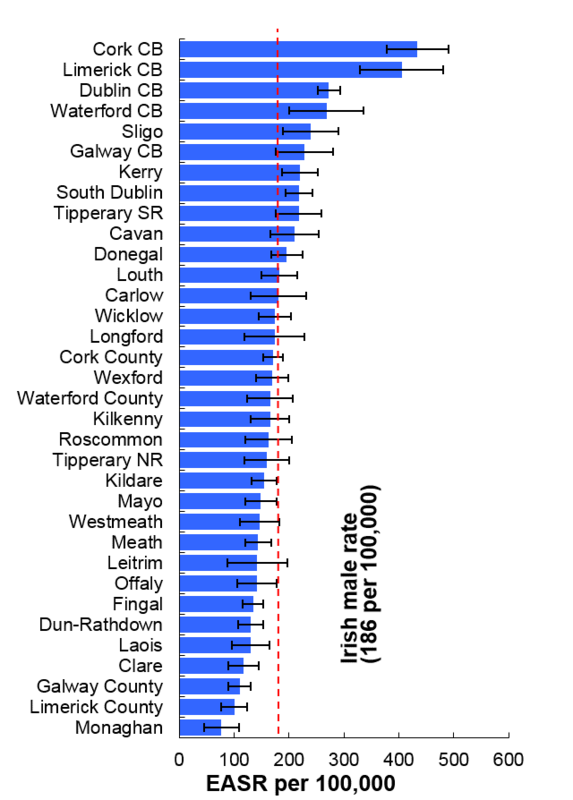 The male rate exceeded 220 per 100,000 in Cork North Lee, Dublin South West and Dublin West. Almost two-thirds (65%) of all self-harm presentations involved an overdose of medication. Drug overdose was more commonly used as a method of self-harm by women than by men. It was involved in 59% of male and 71% of female episodes. Alcohol was involved in 31% of all cases. Alcohol was significantly more often involved in male episodes of self-harm than female episodes (34% and 29%, respectively). 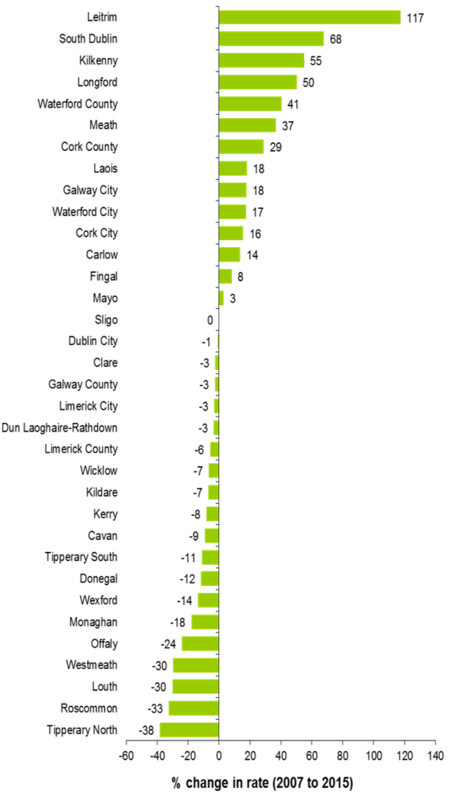 Cutting was the only other common method of self-harm, involved in 27% of all episodes. Cutting was significantly more common in men (29%) than in women (25%). 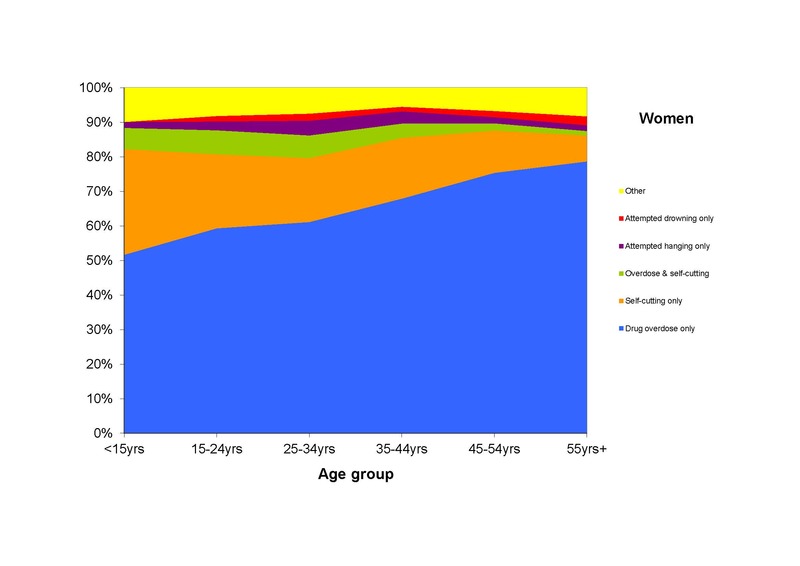 The greater involvement of drug overdose as a female method of self-harm is illustrated in Figure 6. 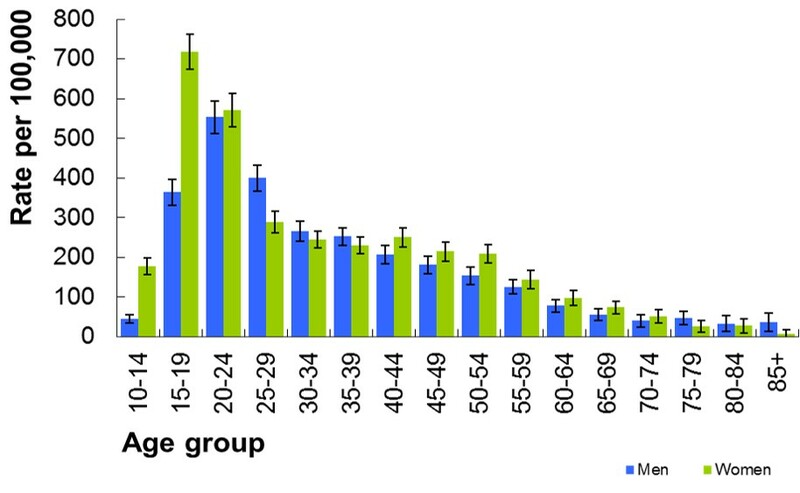 Drug overdose also accounted for a higher proportion of self-harm presentations in the older age groups, in particular for women, whereas self-cutting was less common. Self-cutting was most common among young people – in 30% of presentations by girls under 15 years and 24% of presentations by men aged under 25 years. Dr. Eve Griffin, Professor Ella Arensman, Christina Dillon, Dr. Paul Corcoran, Professor Ivan J Perry, Data Registration Officers.